This incident courtesy of Rebecca and her sweetie, who is learning to limit his words to three syllables or fewer when shopping for cheese. 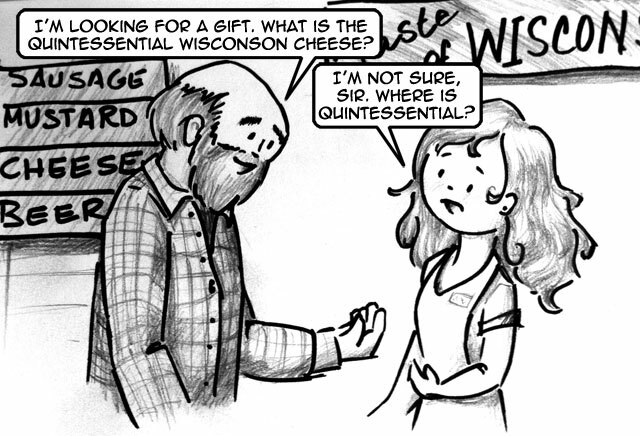 This entry was posted in Art, drawing, Humor and tagged cartoon, cheese, comic, funny, quintessential, Shopping, wisconsin. Bookmark the permalink. And, um, pay no attention to that backward hand. I knew there was a reason that thumb was bothering me. Haha! Funny! Ask a silly question (Duh, “Cheddar Heads”). Get a silly answer. I think Thomas, like Stuart, will be more upset that you drew him bald than with his right hand on the wrong arm.